DIY : QUICK, EASY… AND ICY RELIEF? “LIKE ICE ONLY BETTER”…. Today’s TuesTorial comes from the Massage Therapy students of La’ James International College inDavenport. Have you heard of Biofreeze? This product is a great tool to use at home or in the clinic & is highly recommended by Massage Therapists & Chiropractors around. It’s easy… Biofreeze comes in a convenient 360 degree spray for those hard to reach areas. To use, simply spray on affected areas. 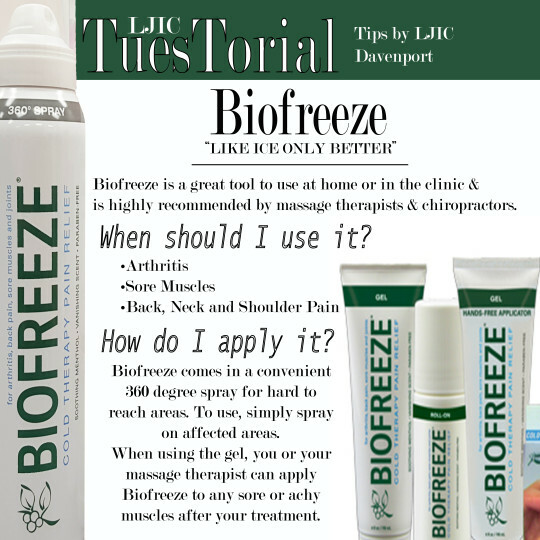 When using the gel, you or your massage therapist can apply Biofreeze to any sore or achy muscles after your treatment. Thank you LJIC – Davenport for sharing this great product and tips!